Rare variety of watermelon called Bradford. Much bigger now. Dwarf tomato trial-lovely larger than most cherry tomato in size. Kale and beets kicking it! Last winter I read about remineralizing gardens and how it’s not enough to add compost every year as minerals will eventually get depleted too as the plants use them up. I’ve been adding compost to my vegetable garden for ten years and have created a fairly rich soil but have never added minerals or trace minerals to my whole garden. So this season I decided two things-add something to remineralize the soil and get a soil test to see how my soil was. I haven’t had a soil test done in about 4 years so I knew I was long overdue especially since I garden so intensively. The test results showed my soil was good except it was low in manganese, sodium and iron and medium for copper, boron, salt, magnesium and potassium. So I researched out what product I should add and I decided on AZOMITE. Azomite is a rock dust mined from Utah and is actually an ancient deposit of aluminum silicate clay and marine minerals. It is a rich source of available potash (0.2%) and over 70 trace minerals, including calcium (1.8%), sodium (0.1%), and magnesium (0.5%). I bought online a 44 lb bag of micronized (consistency of flour) Azomite from Peaceful Valley Farms Organic site but they are not the only source-Amazon sells it in smaller size bags. After I added my usual 2-3 inches of compost in the spring while prepping the beds, I sprinkled Azomite on top of each garden bed and and gently turned it over in the top four inches of soil. I also read you can top dress your plants after you have them in with it. So for my strawberry plants, I just sprinkled it on top of the plants and watered in. The results are amazing-WOW! is an understatement. I don’t think I’ve had such a lush garden ever and I’ve had some amazing gardens. My strawberry beds went from struggling last year (part of that was the drip system wasn’t working very well but part of it was it needed something) to the tallest, happiest, most fruitful plants. The main thing I’ve done differently this year is add Azomite. Now I know we’ve gotten some good rains in August which can only help a garden but all the plants in my veggie garden have gone ballistic growing and producing veggies-it’s like a frigging jungle. I only used around half the bag in my 3000 sq foot garden, so a little goes a long ways. I will sprinkle the other half in next year and will get more for my perennial plants and fruit trees as well for next year. Once done, you won’t have to keep replenishing it every year but every few years, I’m going to add Azomite again. I’ve now cleaned out most of the beds except where the gourds are, the kale bed and the 2 perennials in the garden. The gourds are drying nicely and I picked some of them this week. 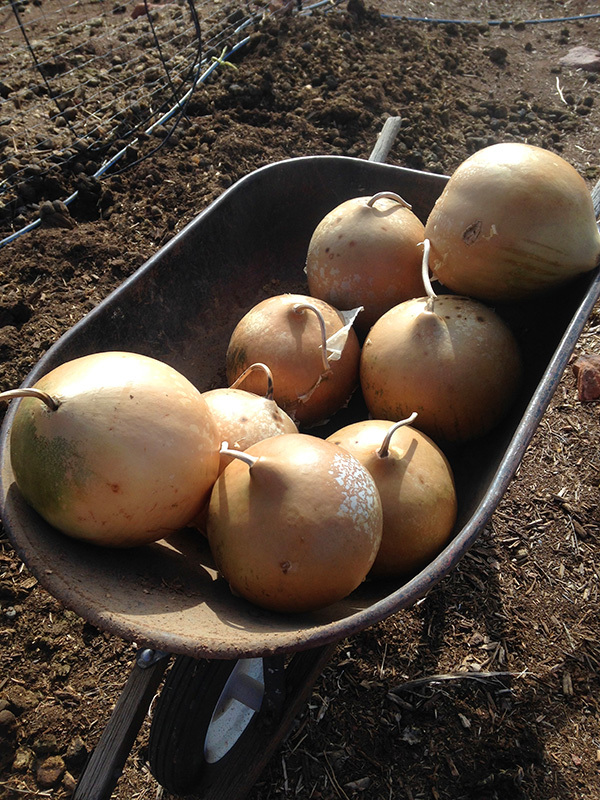 These are African Bushel Gourds. The 2 perennial plants in the garden have gone to sleep-the rhubarb and the strawberries. I will cover the rhubarb crowns shown above with straw (they look dead but they are not). 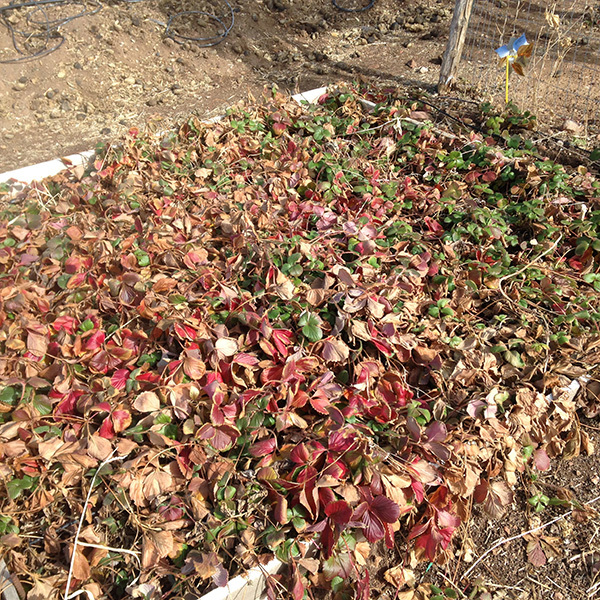 I will put row cover over these strawberry plants as I don’t like raking out straw from the strawberries in the spring-too much work. It is much easier to just uncover them. Look how the leaves turned red. 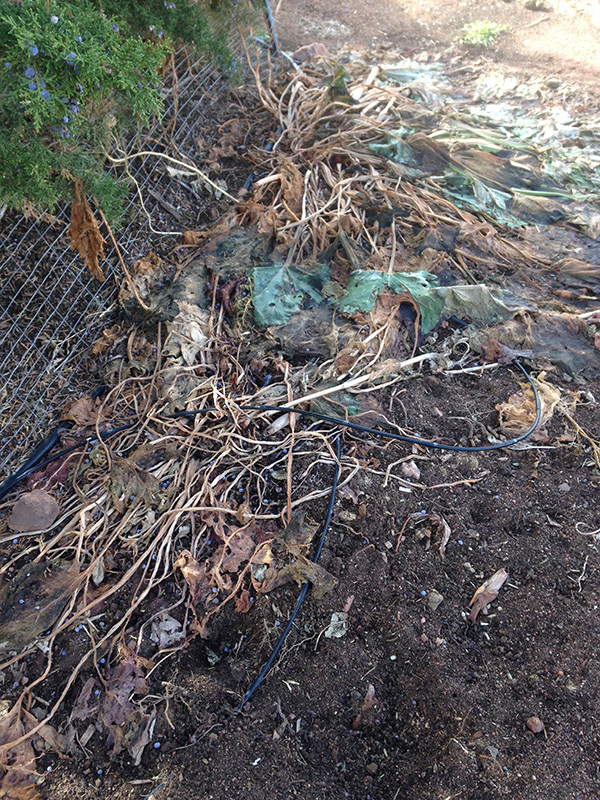 Since the kale is still alive, it is covered with row cover for now. I expect it to die too once we get really cold at night again. My friend Nick and myself put 2 huge trailer loads of horse manure on all the beds after we cleaned them out of the dead plants in November. 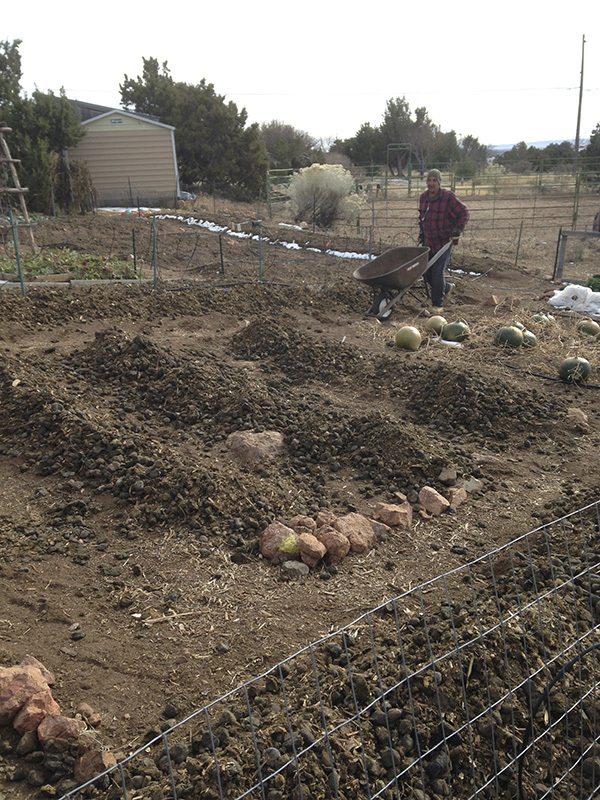 Then we lightly turned the manure over in the soil to add more organic matter to the soil as shown above. This will break down over the winter and be ready to plant by spring. Yea! Because of him I actually got all the fall clean up done! Finally the garden can go to sleep and maybe me! Fall is a wonderful time of the year. The pace slows down for us gardeners. The perennial plants are looking sleepy now as am I, ready for our winter slumber. I want to prune the plants as they are shaggy but don’t dare as pruning now could kill them with these cold nights. Just about everything is done. The outside beds have been cleaned up and I only have a few more beds to put horse manure in. I cut the smaller sunflower heads (with all their seeds) and laid them on the ground for the birds – they’re crazy for them. I just planted garlic before the cold snap and watered it and covered with straw for the winter so it will get a head start before next spring. The herbs will get compost and straw over them to help see them through the winter. I’ve built 2 big compost piles that are hot (140-150°F) that should be ready by next month but will be saved till next spring for the beds. I still have some gourds left in the field, hoping they dry ok. Gourds are always iffy about drying properly especially with our winters, at least for me. I’m waiting for them to get lighter (in weight) before I take them out. And most important, the plants and trees have been watered since I turned off the drip systems. All this sounds like a lot and it is, but I have the luxury of taking my time now. The only tomato plants left were in the greenhouse and froze this last week with the 13°F nights. I had finished buttoning up the greenhouse before the arctic cold blast hit but it still killed the rest of the tomatoes as the greenhouse is not heated. I’ve already planted cold hardy lettuces in there which I can harvest in December and they made it through the cold blast with some winter weight row cover over them. I put a coffee pot in the greenhouse for me when I tinker in there. Perfect! The greenhouse will be very warm in the daytime and pretty cold in the nights which is always a challenge with unheated greenhouses in winters. The goats, horse and chicken water heaters have been turned on and fixed after discovering one of the heaters was not working. The old chickens get a heat lamp to keep them warm at night. The bees have been readied for winter. The barn cats which never came in the house last year are now coming in the house at night which is such a relief. We are ready for winter here at the little farm. Can’t wait to read a good book by the fireplace when it’s cold outside. And lookee! I still have tomatoes in the house and here it is-Nov 15th! I will relish each one now as I won’t be getting any homegrown for a long time! Saving water is so important now in our high desert especially with the drought. Last year I read an article on a company who created oasis in the Saudi Arabia deserts where they get less water than us. I noticed the main ingredients used were polymer crystals and a volcangenic sedimentary mineral (volcanic ash) called Zeolite, both of which absorb water and hold it and nutrients close to the root systems where the plant can use both as needed. I didn’t buy any of the company’s product because they had chemical fertilizers in it but instead experimented on my own with those 2 ingredients and adding my own organic fertilizers/amendments. It doesn’t take a lot of these 2 ingredients. 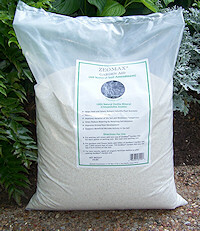 The brand of Zeolite I got is called Zeomax Garden Aid and both that and the polymer crystals came from Amazon.com. The results were amazing. Some of you may know that I expanded my garden last year by 1000 square feet going from 2000 sq ft to 3000 sq ft in my main garden. I put about a tablespoon of both ingredients along with my usual yum-yum mix, compost and other stuff I put in the bottom of each hole for my tomatoes. Then I mixed it up well and planted the transplant on top of the amended soil in the bottom of the hole. All of my garden is on a drip system. I expected my water bill to go up substantially. Amazingly there was no increase in my water bills from the previous year-a savings of about 33% (since I had increased the garden by 1/3 its size or 1000 sq ft) and I only used them on 50 transplanted tomatoes in a brand new raw garden that hasn’t been that heavily amended yet (better amended soil =better water retention). This year I’m going to use them on everything I grow. 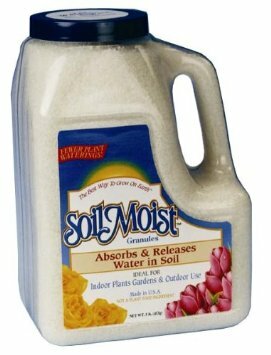 For seeds I plant, I’m going to dig a trough and amend the soil with both of these items, sprinkling it in and plant the seeds on top of it in hopes of saving more water. You can get polymer crystals at Payne’s Nurseries here in town if in a pinch but they are expensive locally and I could not find Zeomax at all locally. Amazon cost less and if you plan ahead before planting this year, I believe you could save some substantial money in your water bill and cut down on your water usage. You can also dig holes around your new plant or an established plant and mix these two ingredients with some dirt and put it back in around the plant being careful around the roots if you already planted. Gardeners should consider getting their soil tested to see where their soil is at-if it has adequate organic matter, what the Nitrogen, Phosphorus and Potassium levels are at, what the pH is of their soil, how high the salt content is, and calcium, sulpher, iron, magnesium levels and much more. 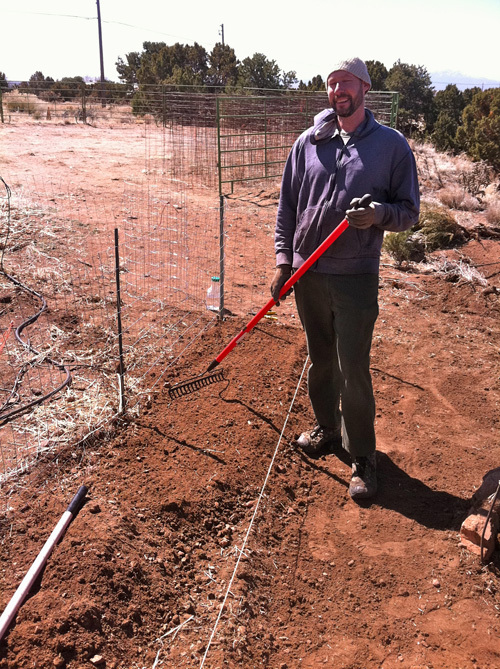 The problem is we use to be able to give soil samples to our county extension agent and he would send it off to the state lab for analysis but that service is no longer available to us here in New Mexico. You can still get a soil analysis done but will have to send it away. I like A & L Labs in California and have used them before. It was well worth it as I found out a lot about my soil. 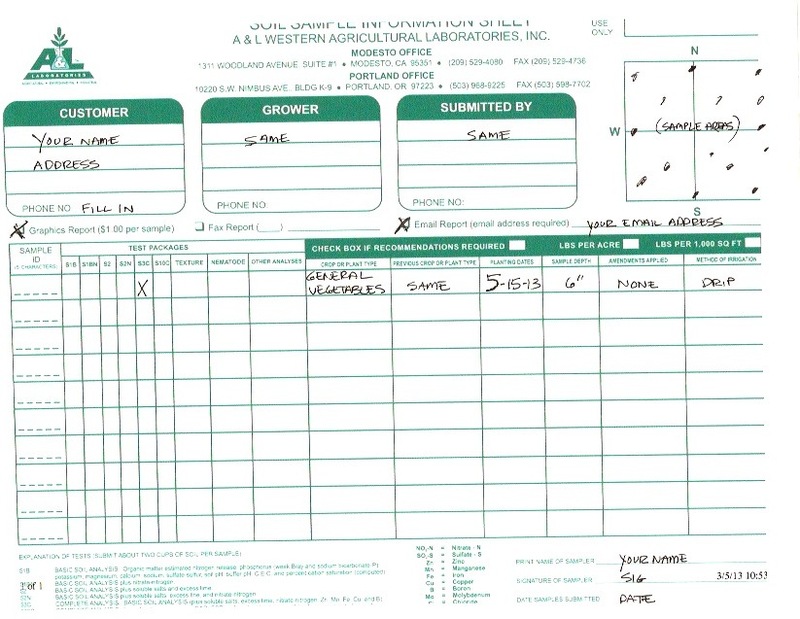 The first time I submitted samples and the form, I had someone walk me through it as it seems complicated but is not. So here’s how to submit your soil samples to A & L labs. This one is in California but there is another one back east if you like. They offer many different kinds of tests but you only need a soil test. 2. Click on ‘Analytical Services’ . They have many different services but you want the ‘Soil Analysis’ section. 3. Click on ‘Sampling’ to see how to collect the soil specimens. Follow their procedures and send the samples (I put mine in a big ziploc baggie) to the address listed along at the bottom of the ‘Sampling’ section with the money $35.00. The price may seem a little steep but when you consider how much money we spend on gardening, it is not a lot to find out about your soil. SAMPLE-Soil Analysis Report-say what??! I didn’t understand this! 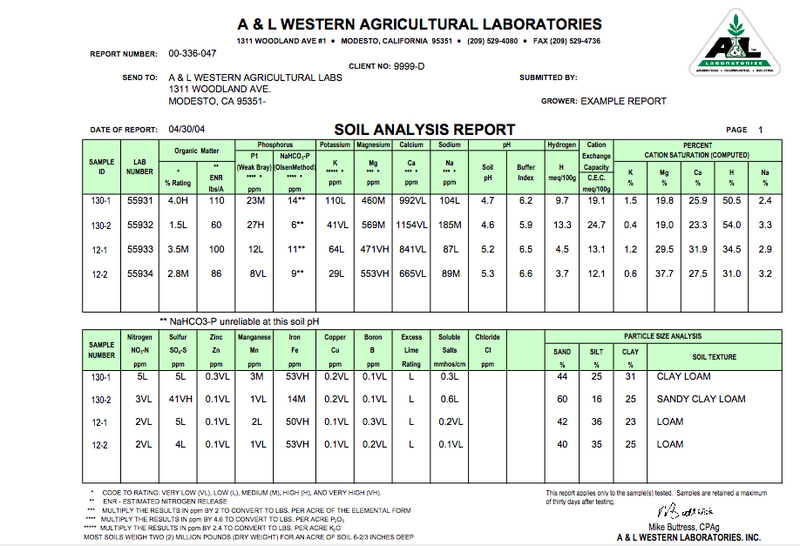 SAMPLE-Graphical Soil Analysis Report-I can understand this much better! 4. Then go back and look at ‘Example Reports’. See examples above. 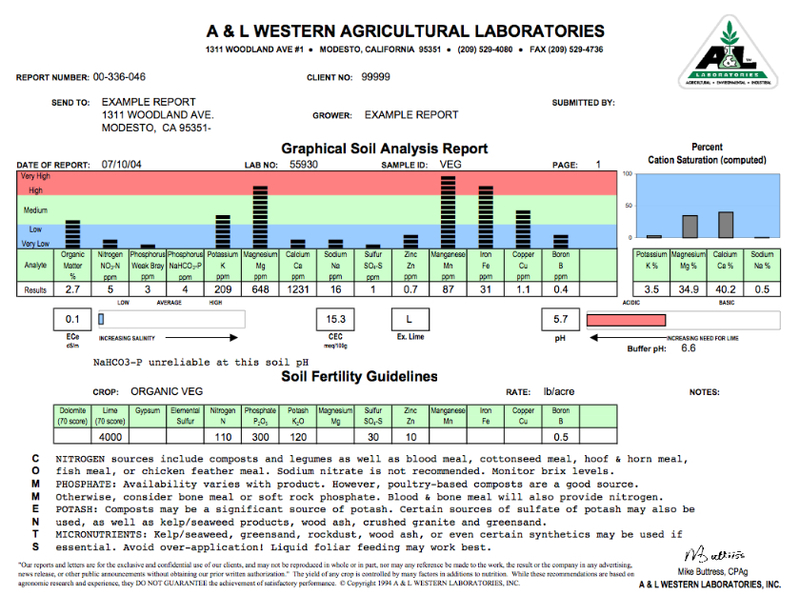 I got the ‘Standard Soil Report’ and be sure to get the ‘Graphical Soil Report’. I didn’t understand everything in the standard soil test but you have to get it to get the graphical soil test which is easy to read and understand. 6. Mail soil samples, money and form back to them. Be sure to check off email return on the form as you will get it sooner than snail mail. It takes about a week to get the results after they receive it. 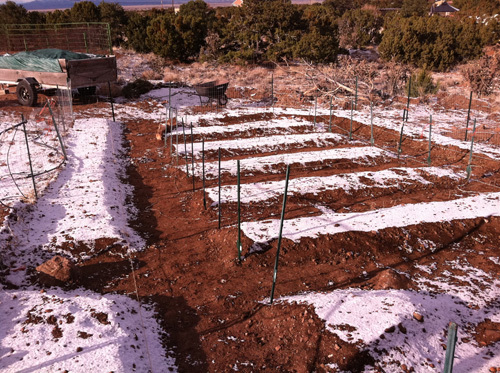 Here is a picture of the new vegetable garden section this morning after a dusting of snow. It is now fenced completely except for the 2 gates, one of which was created today but still needs to be hung. All the raised beds are done. 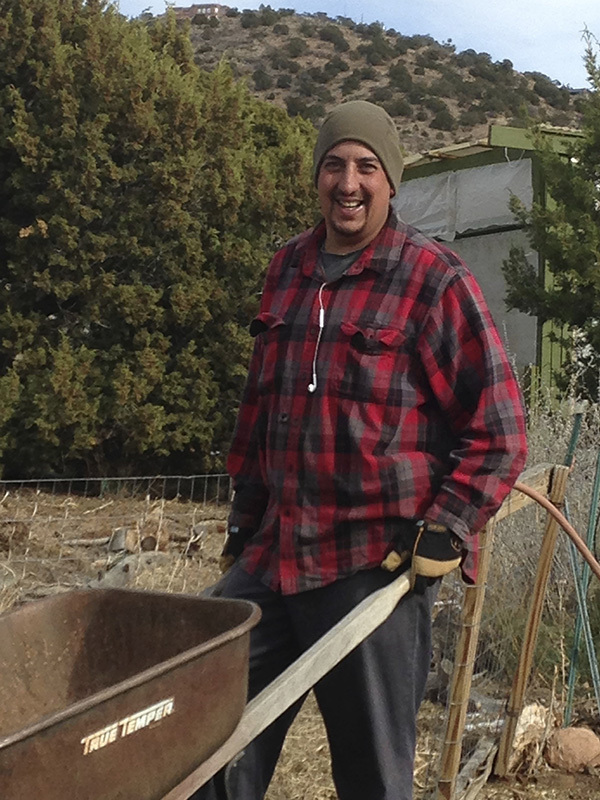 My friend Adam, has been helping me and boy what a help he is! Quite the worker bee! He came out the other day and finished creating the beds except for one area that has a giant rock in it. I swear this rock keeps the whole neighborhood from sinking! So we let it remain (like we could dig it out-ha!) and will make an area with a bird bath and flowers to show it off. The new garden has gone through an amazing transformation since I cleared the land last fall. 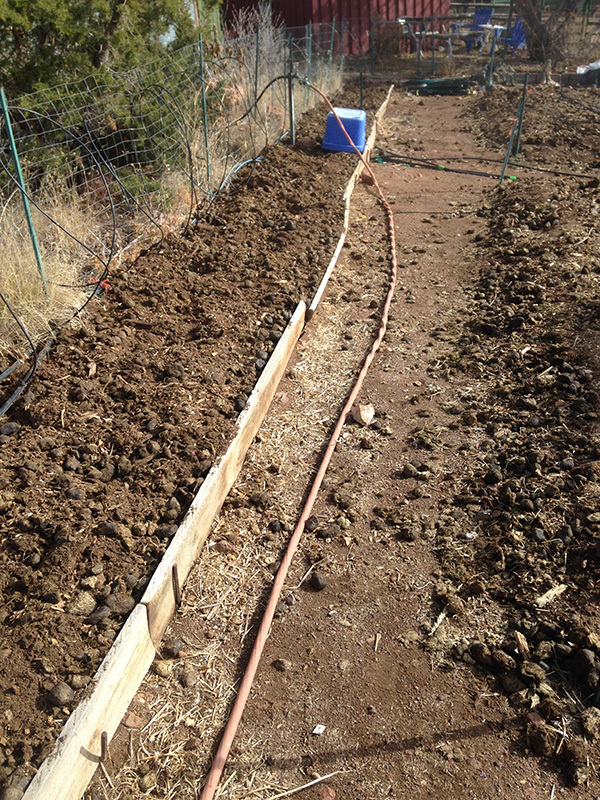 I still have to put the horse manure in the new beds. It’s been a lot of work but is coming along nicely and should be ready by tomato planting time.